Kids these days are not like kids of the past. Nowadays, most children have access to many different electronic devices and they are pretty IT savvy. However, the gadgets are mostly used for portable entertainment and produce a lot of sounds that parents may find distracting or mildly annoying. Asking the child to turn off the sound will take away from the fun experience. The best option is to get the child headphones so that he or she can hear the sounds while the parents can live in a quiet, peaceful home. When deciding on what type of headphones to get a child, there are several factors to consider such as the durability, safety, appearance, etc. We’ve listed several points below for you to take note of so that you can make an informed decision. Volume. This is without a doubt the most important point of the lot. Children like things loud and exciting. They’ll have no qualms about turning up the volume to the maximum just to have a good time. However, their hearing is sensitive and more prone to damage. So, there must be caution here. Many auditory health organizations recommend a maximum noise level of 85 decibels (dB). Exposure to sounds above 85 dB can result in hearing loss even if the exposure is just for a short while. Most kids headphones have a setting that enables you to limit the volume even when it’s turned to its maximum. Noise Reduction. Children are no different to adults when it comes to distractions. For example, when a child is listening to a cartoon and adults are talking around him, his first reaction will be to turn up the volume to drown out the ambient noises. To prevent this, it’s best to get a set of headphones that have noise reduction. With this feature, ambient noises are cancelled out and also noise from the headphones will not leak out. You get the best of both worlds. Comfortable Fit. Since children have smaller heads than adults and as the child grows, the head will get bigger, it’s best to get a pair that has a headband that can be easily adjusted. Pay attention to the padding on the earcups. It has to be soft and the earcups need to sit snugly on the child’s ears so that it’s comfortable. Kid Friendly Design. Generally, children like bright colors and bold designs. They also tend to handle things roughly and may end up dropping, scratching or even stepping on the headphones. 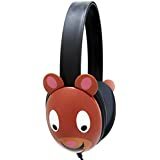 Good children’s headphones will be durable enough to handle all these mishaps and they’ll also be designed in a way that the children will find very attractive. Price. Find a pair that is durable, high quality and still affordable. Unlike adults who view headphones as an electronics accessory, the child views it as a toy. So, there’s no real need to spend too much on the headphones. Just buy one that’s affordable and meets the criteria. We’ve selected some of the top headphones for kids and took into account factors such as design, comfort, noise reduction, volume limits and price. 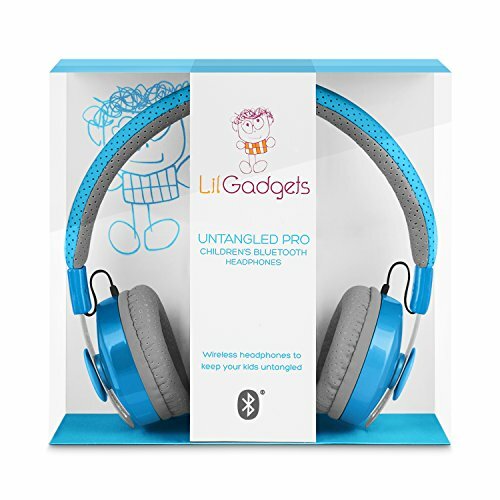 After research and testing, we found that the LilGadgets Untangled Pro Children’s Wireless Bluetooth Headphones created by LilGadgets are the best headphones for kids. There is no cord attached so there will be no entanglement or accidental yanking of the cord leading to damage. It’s wireless and compatible with almost all Bluetooth devices. One charge get about 10 hours of play time and you can easily charge it with the USB charging cable or you can use the 3.5mm cable to charge it at a power point. The fact that these headphones were designed for kids means that it’s comfortable for kids and uses a SoftTouch breathable mesh to keep the child cool during extended use. The product is durable and the buttons left ear piece will allow the kid or parent to control the volume and even make calls. Yes, it comes with a microphone too in the bottom right corner. You can easily pair this device with a computer or mobile phone. You are provided a microfiber bag so that you can store the headphones easily. The design does not have cartoons or wild designs but comes in attractive colors such as pink, black, white and blue. It comes with a 1-year warranty and a 100% satisfaction guarantee. 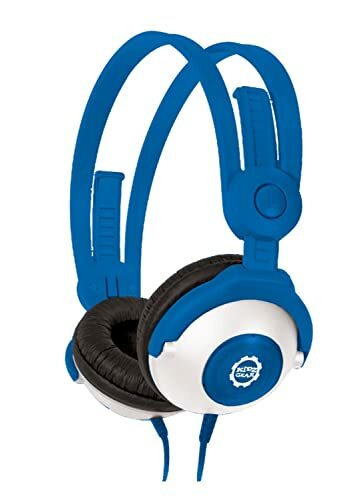 This is a highly affordable set of headphones that is under $30 and the Kidz Gear Wired Headphones come with all the usual features that any good kids headphones should have. There is a safe volume limit of 20dB and even at maximum volume, it doesn’t exceed this setting. The headband is easily adjustable and can fit a toddler just as easily as it could fit a teenager. It works well with most popular devices such as iPhones and iPads. For its low price, you’ll be amazed to know that it’s made with the same high quality components that are used in adult headphones. 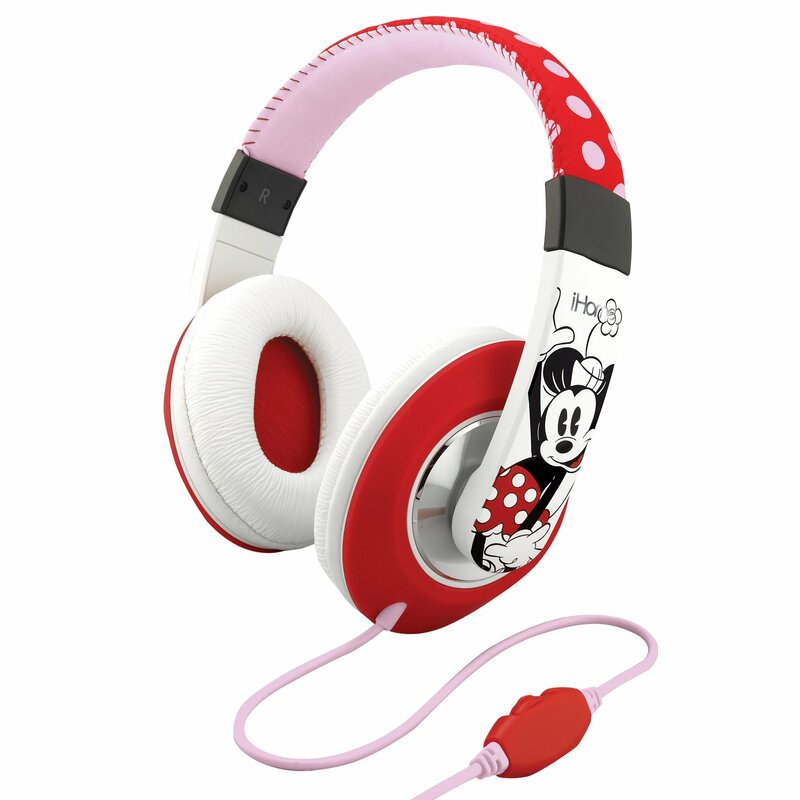 Your kid can easily use these headphones with portable game players, TVs, apple products, etc. The attractive colors such as blue, pink, orange, purple and green are appealing to most children and the headphones are backed by a lifetime warranty and are 100% guaranteed. 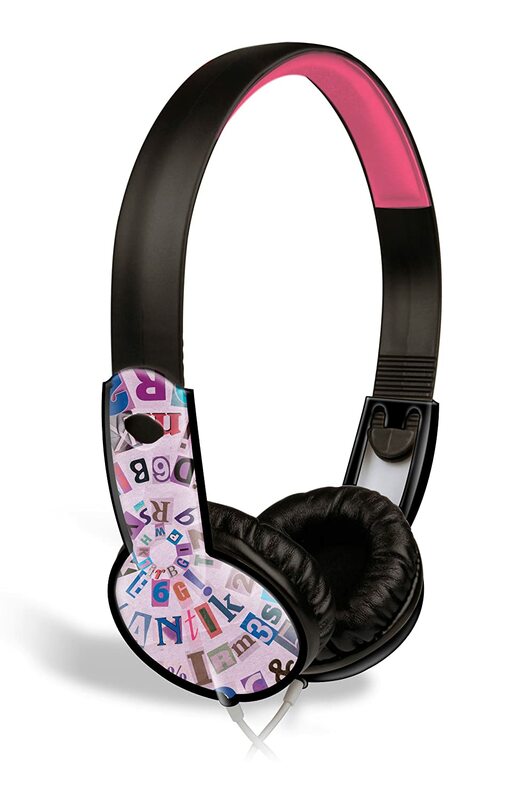 The third in our set of reviews, the JLab JBuddies Kids Volume Limiting Headphones is all about safety. The very name says that it is focused on providing a good sound experience for your child while limiting the volume of sound they’re exposed to. 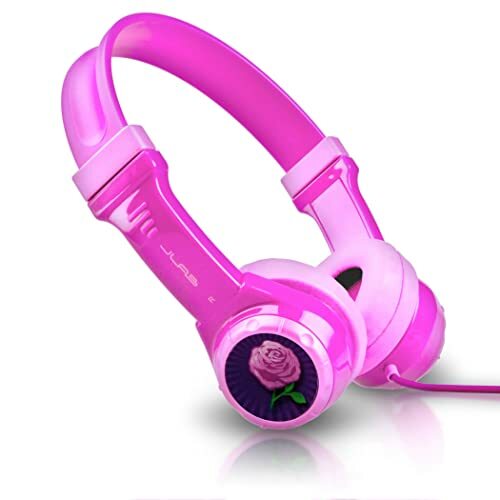 These attractive headphones which come in colors such as purple, pink, blue and black are also pretty tough and can withstand a lot of rough handling that’s typical when used by kids. The ear cushions are hypoallergenic and the entire headset is spill resistant, thanks to the durable plastic construction. The volume stays below 30db because of the built-in volume regulator. The JLab JBuddies headphones are comfortable to use even for extended periods. They’re compatible with most portable devices. You get the standard 3.5mm jack that will allow you to connect it to mobile phones, portable DVD players, portable game players, etc. Also priced below $30, this is value for money that is backed by a 1-year warranty and excellent customer service from JLab.